NAFTA banners hang in Mexico City, where the next round of talks are underway. MEXICO CITY — Mexico and Canada aim to finish reworking less contentious chapters of the NAFTA trade deal with the United States in new talks that began on Sunday, hoping to clear the path for a breakthrough on the toughest issues before upcoming elections. Once agreement is reached on technical chapters such as state-owned enterprises, barriers to trade and e-commerce, about 10 per cent of the modernized accord would eventually be left over for political leaders to work out, de la Vega estimated. 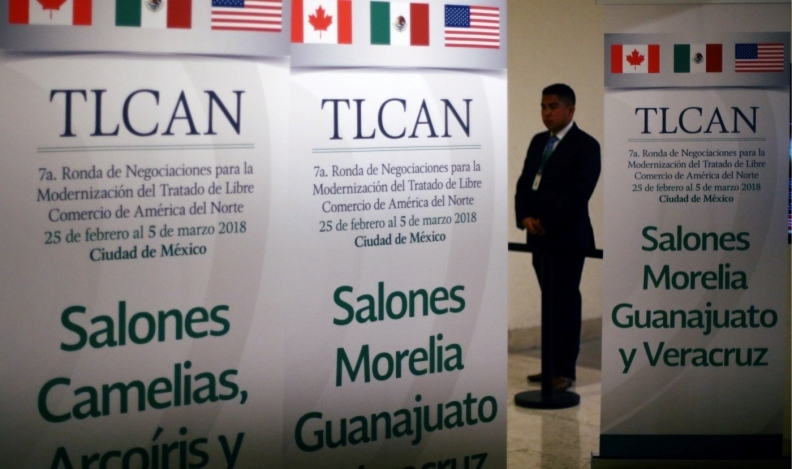 A schedule for the round showed that the discussions would include rules of origin for the first three days, an issue at the heart of the Trump administration’s demand to raise the amount of auto content sourced from the NAFTA region. Under NAFTA, at least 62.5 per cent of the net cost of a passenger car or light truck must originate in the region to avoid tariffs. Trump wants the threshold raised to 85 per cent. The North American auto industry has pushed back against Trump’s demands, arguing it would damage competitiveness and regional supply chains. Mexico aims to build on the previous round in Montreal, when Canada floated proposals to address U.S. demands, including one to include costs for engineering, research and development and other items in the total value of an auto. The schedule showed that several chapters which negotiators have signaled are close to concluding, including e-commerce, telecommunications and energy, are up for discussion towards the end of the round. Financial services will last for three days. The office of Minnesota governor Mark Dayton on Friday published a letter sent this month to U.S. Trade Representative Robert Lighthizer in which he urged him to “preserve and expand market access” under NAFTA, and build on existing ties.